William Styles was baptized in Grafton Flyford, Worcestershire on 29 Aug 1771. He was the third eldest surviving son of Thomas Styles, latterly the inn keeper of the Crown Inn in Stone Staffordshire. He married Elizabeth Evans in Old Swinford on 28 Apr 1795. She was the sister of his brother-in-law Richard Evans, the proprietor of the Red Lion Inn in Wolverhampton. The couple had no children and both William and Elizabeth are recorded as being buried in St Michael and All Angels in Tettenhall on 3 Dec 1808 and 7 April 1809 respectively. This was the same church where William’s sister Sarah Evans was buried on 4 May 1812, some three years later and is where a number of the Evans family are buried to the North West of Wolverhampton. William is not mentioned in his father’s will of 1811 or his brother Thomas’s in 1816. Significantly in the Tettenhall register, William Styles is described as ‘from Birmingham’. In other documents he is described as a Victualler and Inn holder (National Archives). This helps confirm he was the proprietor of the Hotel in Temple Row, Birmingham from 1795 to 1809 where the name William Styles can be found on a number of references (London Gazette, Warwickshire Licensed Victuallers etc ). He took a twenty one year lease starting in 1795 from the tontine that owned the building for £120 per year. 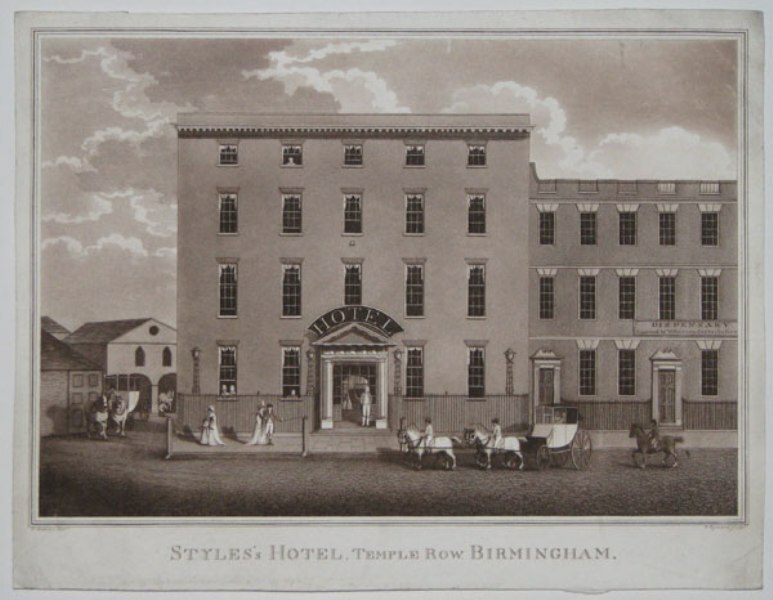 The Hotel in Birmingham, had originally been built in 1772, dubbed for some time Styles’s Hotel, was later to become the Royal Hotel and was essentially a new concept, superior in many ways to an Inn, with a French name to describe it. Like the Red Lion Inn in Wolverhampton, run by his sister’s family, it was a major civic centre and had assembly rooms and sumptuous dining rooms – but as the city of Birmingham grew, the main stream of its business was probably not so much the through coaching trade as the city became a destination in its own right. The Red Lion as the staging post for the main coaches to Dublin via Holyhead had built up its reputation from 1790 right up to 1820 as Wolverhampton’s most important coaching Inn. When coaches such as the ‘Wonder’ were running at full tilt from London to Shrewsbury within a single day, horses were generally changed every ten or eleven miles. The stage between Wolverhampton and Birmingham was at Wednesbury. However the distance of just over twenty miles, as measured between the Red Lion and the Styles Hotel was becoming more practical on better roads. It is clear that the logistics of resting, foddering and returning horses was a major issue in the trade and having the ownership of these two major Inns in the hands of one family made business sense but was also a clear dynastic ambition demonstrated by the double marriage between the Evans and Styles families. Richard Evans, married to William’s sister Sarah, allegedly kept the finest set of chestnut horses in the area which were used to pull the striking yellow livery of “The Wonder”. It is easy to see that with the Crown Inn in Stone to the north run by William’s father and later brother, Thomas, and the Styles Hotel run by William, himself, the logistics of running the best coach and hospitality service in the area was well served and potentially economically advantageous. The Post Magazine and Insurance Monitor 1895 Vol 56 Page 54 for details of the Tontine that was set up when the hotel was built in 1772.